When J&J mom Kimberly’s son was diagnosed with autism, she realized that her parenting experience was going to be different than she expected – in ways that have helped her grow both professionally and personally. Here is Kim’s story. When we first learned that my oldest son Tyler had autism , a very wise mom said, “You may have thought you were boarding a plane to Florida, but ended up in Australia.” What she meant was that the destination in our parenting journey may have been different than what I expected, but it’s amazing nonetheless. She couldn’t have been more right. I have learned a lot about myself while parenting these last 7 years – things that I never would have realized about myself had I not “ended up in Australia.” Parenting any child takes patience and persistence and love. Parenting a child with autism takes a whole lot more of the patience and persistence. The countless hours of therapy to accomplish the small task of being able to ask for more milk instead of screaming, or the resilience it takes to sit in front of numerous school officials and fight for more hours of speech therapy at school. These are just a few examples of the activities that you don’t imagine when you first learn that you are having a child. These are things that I never would have thought that I could do – now, they are part of daily life. These lessons… ones that I would have never had had it not been for autism…have affected me both personally and professionally. I now take a much more methodical approach to handling work challenges. In the past, I may have kept doing something the same way (despite the outcome). I now have the knowledge that so much can be accomplished if I just change my approach. Whether it is changing my style to fit that of a customer, or simply speaking their language. So many of my work customers speak a different language – meaning that they process information differently, just like my sons. I never realized that approach and delivery could have such an effect on the desired outcome. Now I do. I think the biggest change for me has been in my own personal “thickening of skin.” Before I started this journey, I would agree with others to avoid feeling uncomfortable. Well…feeling uncomfortable is par for the course when parenting an autistic child! It has become par for the course for me at work as well – to my professional benefit. It’s only in working through uncomfortable situations that we truly grow. We have a mantra in our region: “lean in and challenge.” For some people, this is a difficult philosophy to live every day. It is for me sometimes, too. However , fighting for what I feel is right or needed for my child has given me countless opportunities to practice it. It’s not backing down when a customer challenges you and knowing that you have to have passion and conviction or else change will never happen. It’s being able to have the confidence in oneself and respect for others to get someone to listen to you, even if they might not like what you are saying. In the end, it’s about being a fighter. In my BA (before autism) life I would say that I was a light weight. Now with so much gratitude to both my sons for teaching me new things every day, I can say that I am a heavy weight fighter – both as a parent and as a professional. We love that our parenting journey has taken us to an unexpected – and wonderful – destination. Many other J&J parents are raising autistic children. Carrie writes about the joys of parenting a child with autism, Elvie shares how cultural differences about autism have posed a challenge in raising her son, and Kirstie writes that it’s important to pay attention to the siblings of autistic children, too. 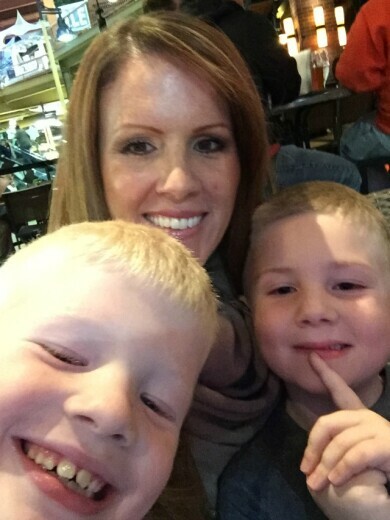 Kimberly Mierek lives in Syracuse, NY with her two sons,Tyler and Casey, and husband Mike. She has been with Johnson & Johnson for almost 6 years and works in the CVI division as an executive sales representative. She loves to play sports, hang with her wonderful friends and family (it takes a village) and travel as a family.